A beautiful decorative lantern is one of many which adorns the Chinese Gardens at the Montreal Botanical Garden in Montreal, Quebec at the Magic of Lanterns Festival. 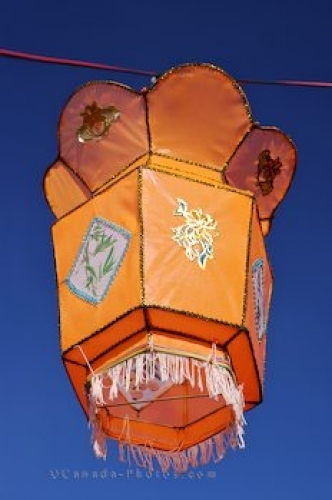 The lantern is part of the Chinese cultural and each one has been handcrafted with their own unique design. Lantern at the Chinese Garden during the Magic of Lanterns Festival at the Montreal Botanical Garden, Jardin Botanique de Montreal, Hochelaga-Maisonneuve, Montreal, Quebec, Canada. Picture of a decorative lantern at the Montreal Botanical Garden during a yearly festival.